Radishes are an edible root vegetable mostly eaten raw as a crunchy salad vegetable. Once washed and trimmed, radishes can be cooked or served raw - typically cut in thin slices and tossed in salads for their crispy texture and peppery flavor. The radish's peppery flavor resembles that of mustard, horseradish and wasabi. 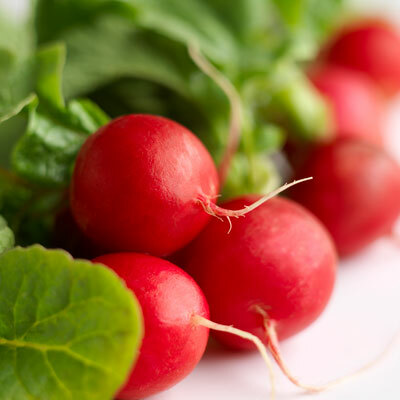 Choose radishes with a smooth, untarnished surface and bright color. If the leaves are intact, they should appear fresh and vibrant. Remove the tops since radishes do not keep as well with their tops left on. Store radishes in plastic bags inside the crisper section of the refrigerator. Always wash fresh produce before consuming.